Keep your dog off the sofa by providing it with a comfy crash pad. Keep your dog off the sofa by providing it with a comfy crash-pad. 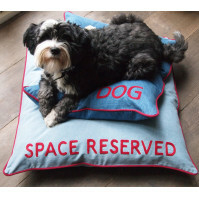 100 percent cotton was..
60cm x 60cm Washed Black..
Keep your dog off the sofa by providing it with a comfy crash pad. 100 percent cotton wa..
Keep your dog off the sofa by providing it with a comfy crash-pad. 100 percent cotton washed de..